Will markets calm down this week? Or will the gut-wrenching turbulence continue? 1. Stock market moves: U.S. stock futures are all edging up Monday, but this follows a dramatic week where fear gripped the markets and the Dow Jones industrial average erased all its gains for the year. Even though equities posted a big comeback on Friday, the latest reading on the CNNMoney Fear & Greed index indicates investors are feeling very fearful. Investors are expected to be on edge as they await earnings from multinational giants this week. Related: Nightmare on Wall Street: Is it over? 2. Earnings parade: Apple (AAPL), IBM (IBM) and Chipotle (CMG) will report quarterly results at the close. IBM said that in addition to releasing results, it will also make "a major business announcement." Bloomberg reported that IBM was about to pay Abu Dhabi's GlobalFoundaries $1.5 billion to take its unprofitable chip making unit off its hands. As for Apple, it's launching Apple Pay Monday, allowing customers to pay for items with their iPhone 6s. Firms reporting before the markets open include toy-maker Hasbro (HAS), newspaper publisher Gannett (GCI) and drug company Valeant (VRX). 3. International markets overview: European markets are all declining in early trading after a slew of major European firms reported disappointing earnings. Many of the main indexes were down by about 1%. Adidas (ADDDF) shares jumped 5% on a Wall Street Journal report that a consortium of investors was interested in buying its Reebok unit. Lufthansa (DLAKY) fell 1.3% as it was forced to cancel 1,500 flights due to a pilots' strike. Asian markets all closed with gains, inspired by a Friday market rally in the U.S.
Japan's Nikkei surged by nearly 4%, supported by reports saying the country's massive public pension fund would funnel more money into the domestic stock market. There were also reports that the government may postpone a second increase in sales tax. 4. 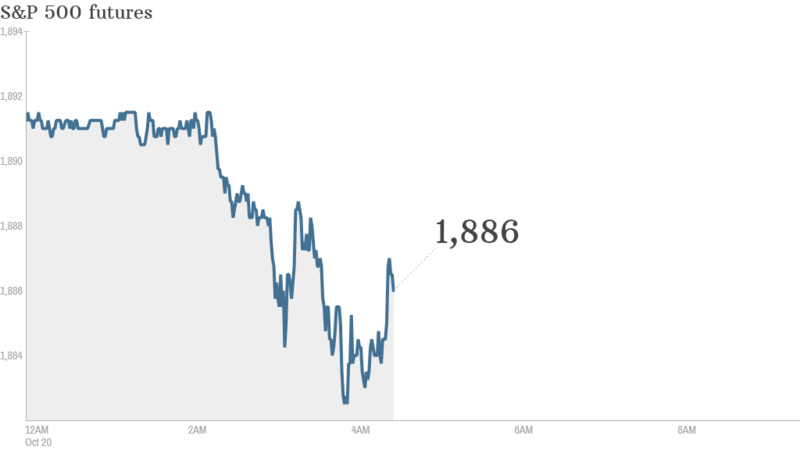 Friday market recap: After a week of steep declines, the Dow rose 263 points, or 1.6% Friday. The S&P 500 was up 1.3% and the Nasdaq jumped by about 1%.